This was a trip that I took in January 2012. Somehow the detailed account remained as a draft for a long time. As the plane started its descent at Bhubaneswar I was busy taking pictures of the river and the city that unfolded before my eyes. 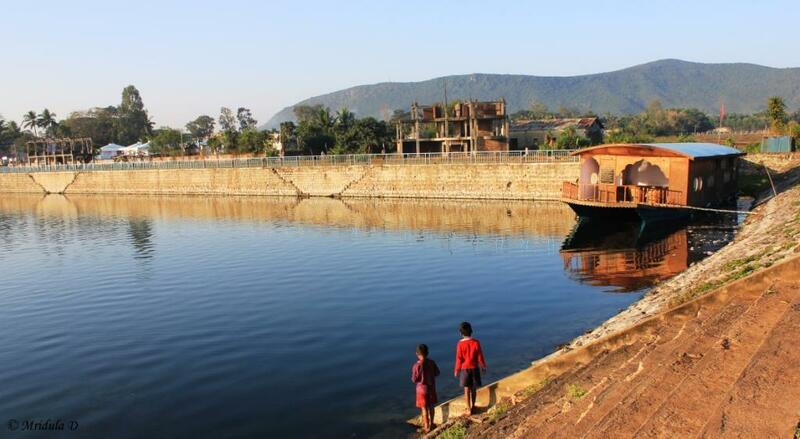 This was my first visit to the state of Odisha in India. 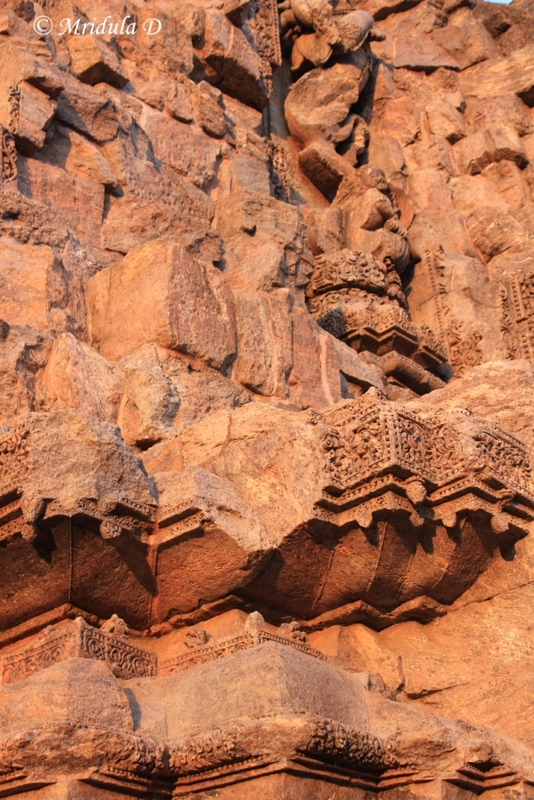 I took an Indigo Airways flight from New Delhi and had no major hassles. There was one small hiccup at the beginning of the journey though. There are now two departures terminals in New Delhi for domestic flights- T3 and 1D. Earlier all the domestic flights were from 1D and those were the days when you didn’t had to bother. This time I mistakenly arrived at T3 when my flight was scheduled from 1D. As I usually turn up quite early for a flight I could go from T3 to 1D and still have breakfast and then catch my flight. My primary purpose of visiting Odisha was to meet my friend Ritu and her husband Anurag. The plan was to go sightseeing together. Anurag picked me up at the airport. Bhubaneswar is a small city, from airport to the outskirts it was about 20 minutes. I like such cities. 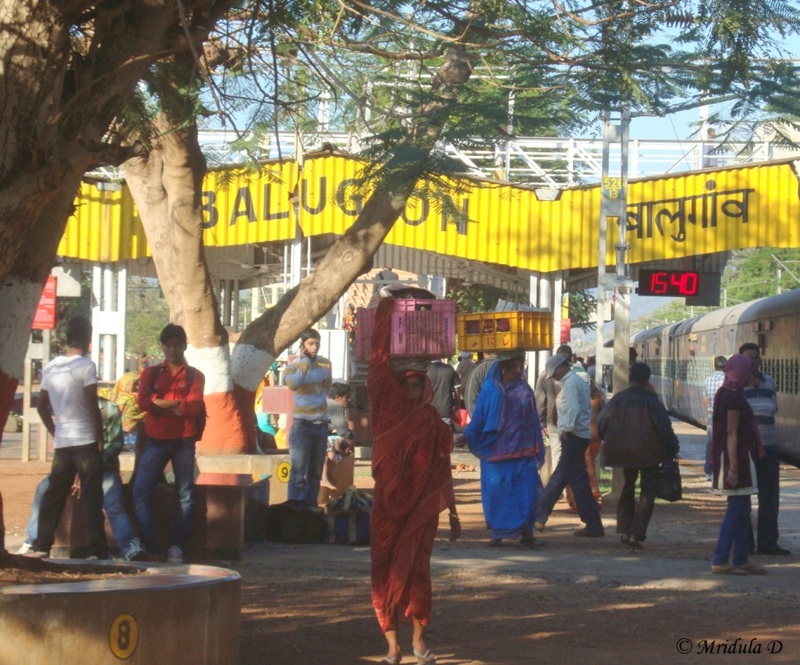 After a lot of tea, catching up and food we headed to the Bhubaneswar railway station, we were taking a train to Balugaon, which is close to Barkul, Chilika. 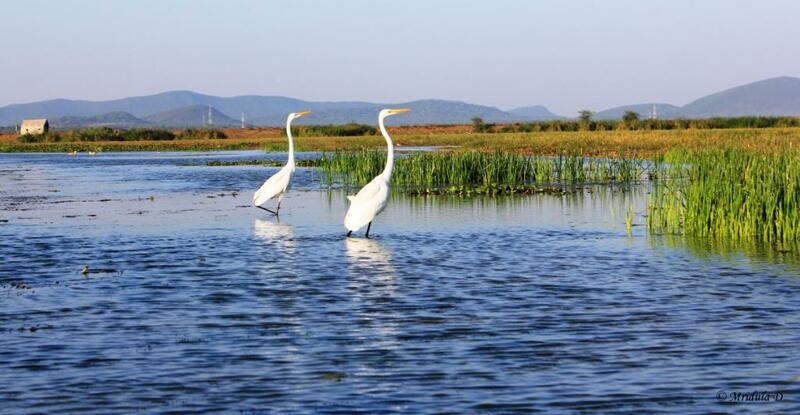 Chilika Lake was our first stop. Even though the three of us were at the same college campus I was meeting Anurag in a way for the first time. It was great that he also is a keen bird watcher and took charge of our itinerary and included Mangalajodi. After getting down at Balugaon we took an auto to the OTDC Pantha Niwas at Barkul. The road to the hotel was more of an apology for a road but thankfully the journey was short. As far as I could spot Pantha Niwas was the most prominent hotel at this stretch. It is a government run hotel. Most of the government run properties are at excellent locations and this one was no exception. Also most of them do not offer much by the way of comfort and this was also true of the Barkul property. But the people at the hotel were so polite that they make up for its other deficiencies. We reached there by evening and after dumping our luggage we headed straight for the lake, which was a two minute walk. From my balcony also I had a view of the lake. We negotiated with a boatman and went for a boat ride at the lake. 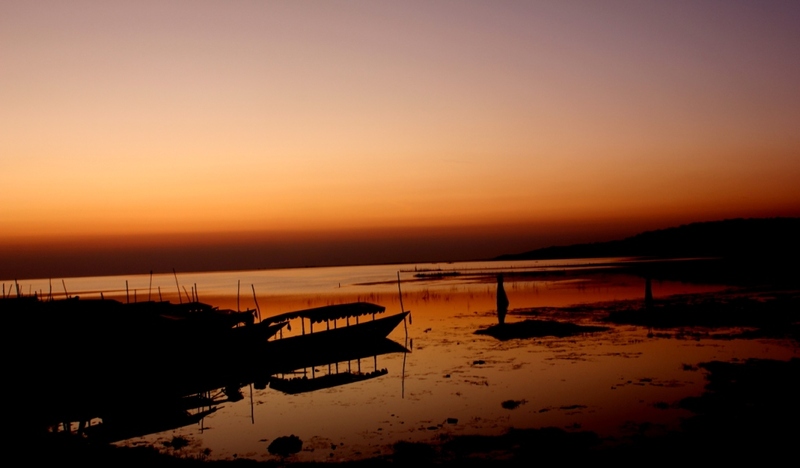 My first impression was that lake is a misnomer for Chilika, it is more like a mini ocean. 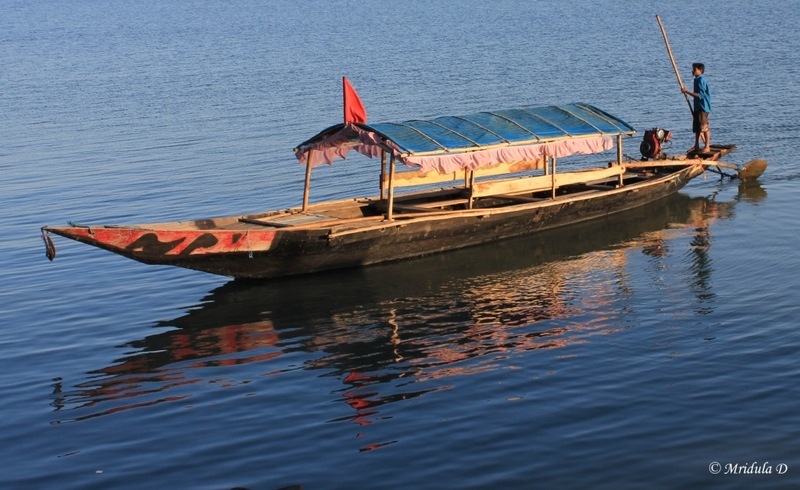 But the waters were shallow and the boat can be rowed by a tall bamboo pole (quite like punting at Oxford, UK). It was the sunset time so everything looked doubly beautiful. The golden light had cast a spell over the lake, other boats, the fishing nets, the birds and pretty much everything else. After the boat ride we headed to the restaurant at the hotel and ordered tea and paneer pakoras (cottage cheese dipped in chickpea batter, deep fried) to eat. The place was not fancy but they produced quite good food. Stomachs full we decided to rest in our rooms for a while and then re-group for dinner. I discovered during this break that the bathroom had no hot water but that is the price you pay in India if you wish to explore offbeat places. The room had a TV so I watched badminton for a while. Soon it was time for dinner and we decided to be a bit adventurous. Anurag asked if the hotel would serve the local dish Dalma (lentil and vegetable based curry) but they said not enough orders were there to make it. I asked Anurag if he liked prawns and would he order it? I usually eat vegetarian fare but at times I demonstrate a more adventurous streak. Fish is the most adventurous I can get though. I know from past experience that I cannot finish a non-vegetarian dish hence I depend on others to order it and share with me bits and pieces of it. Anurag was game for prawns whereas Ritu and I went for a vegetarian fare. When the food arrived there was a surprise for us. The staff shared Dalma with us which one of them had brought from home! And it indeed was wonderful. I ate two prawns and liked it a lot. Later when I ate prawns at Bhubaneswar I realized how fresh the prawns at Chilika were. At night I decided I was going to make an effort to get up at dawn to click the sunrise. I decided to draw away the curtains so that I could see the dawn from the bed itself to begin with. And when I opened the curtains what a site greeted me! There was a big moon casting a silver glow around and leaving a big thread of silver on the water. I ran away with my tripod and the camera but I could not capture even a single decent picture much to my disappointment. I find it such a chore to get up early in the mornings but I dragged myself out of the bed at 5.30 am. My friends also did the same. We spent a lot of time around the lake and had it almost to us for quite some time. But it was also a day of a religious festival and devotees soon started arriving in numbers. I walked around a little longer before joining Ritu and Anurag for breakfast. After breakfast we were heading to Mangalajodi, a birder’s paradise. We took an auto to Barkul Bus Stand. The bus stand was so tiny and hidden behind shops that we really had to ask round to get convinced that we were really at the correct place. The bus arrived after a while and took us to Chandpur Tangi. 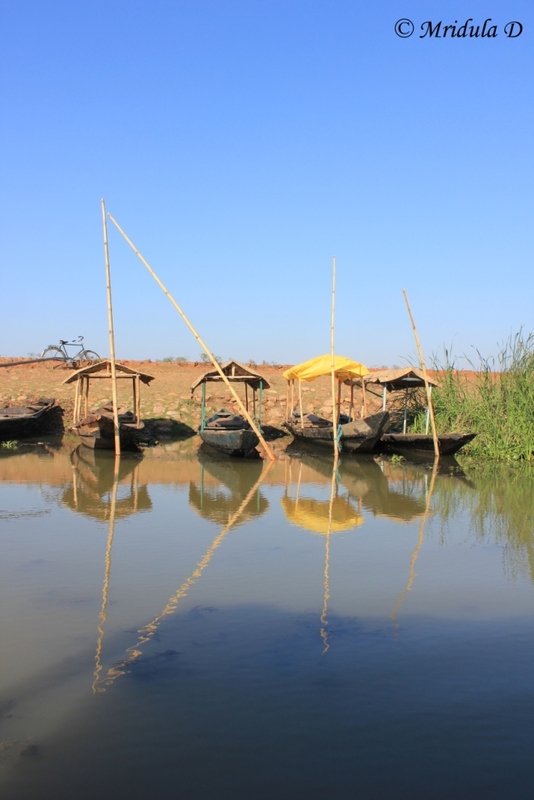 We had already informed the people at Mangalajodi (use their contact us information) that we were coming and we would need a transport from Chandpur Tangi to Mangalajodi. They sent an auto that took us on a narrow deserted road to the tiny village of Mangalajodi. It dropped us at the ecotourism complex. By now it was noon and we decided to have lunch first and then head for the marshy waters and the boat ride for bird watching. 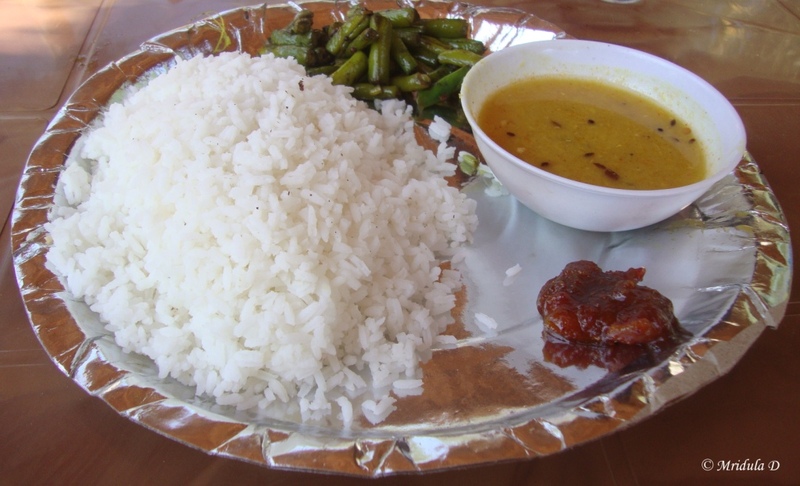 The food was simple- daal, rice, beans, pickles and papad. I initially thought the quantity was too much but soon everything was gone from my plate. Food over, the auto took us to the place where the boat was waiting for us. Mangalajodi was not always a birder’s paradise. Folks say that 10-15 years ago villagers used to kill the birds that used to migrate to Mangalajodi. Gradually NGOs got involved and converted the villagers to protect the birds. If you talk to villagers now they take pride that people from different parts of the world come to their small village. I did not have a zoom lens on this trip and sometimes that can give a different perspective to bird watching. Our three hour boat ride was incredible. I saw a lot many birds at close quarters- Black Winged Silts, Purple Herons, Egrets, Black Ibis, Indian Pond Herons, Purple Moorhens and Kingfishers of various hues. But the stars of the visit were Black Tailed Godwits. They would fly in black and silver clouds around the place which was an amazing site. Even otherwise the flat land looks endless; it is an intriguing landscape. Anurag said it gave a feeling of being at the end of the world. Mangalajodi is not well known now but I am very sure this will change soon. To stay there one has to coordinate with the eco tourism complex or be brave like Vaibhav and just turn up and stay wherever one can. We did it as a day trip this time. 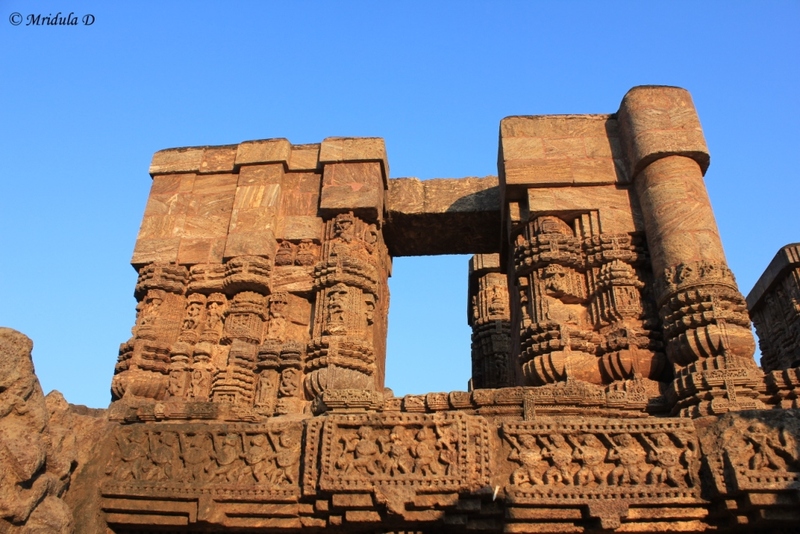 Our last stop was Konark, home to the UNESCO world heritage monument- the Konark temple. It is a sensual temple devoted to pleasure. It is a bit difficult to understand how we became such a closed nation when we have such a liberal heritage on relationships! The monument is grand, we saw it in evening light but photography opportunities were not good as it was going through restoration. It also draws huge crowds. 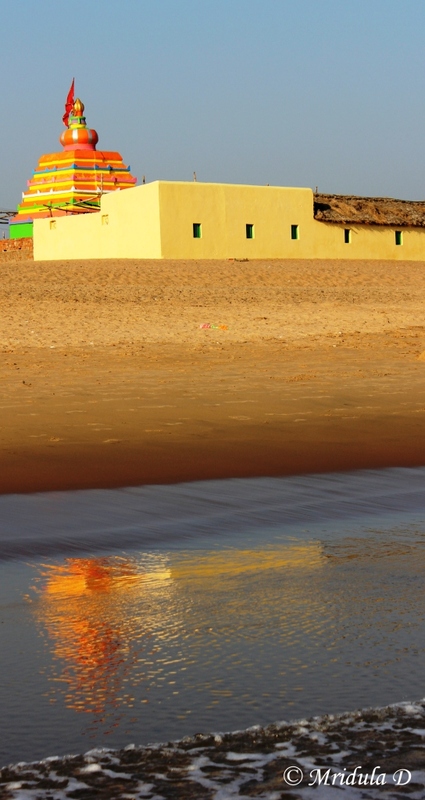 We spent a long time on the Chandrabhaga Beach at Konark. 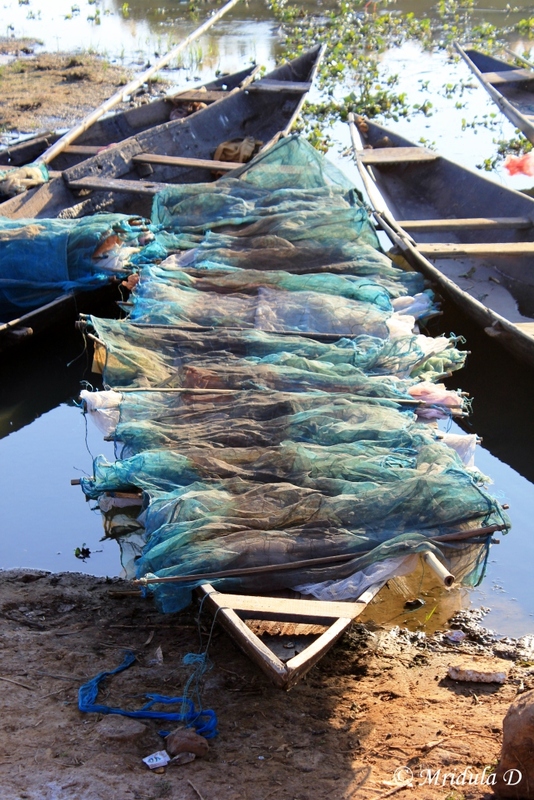 I took a long walk and clicked colourful fishing boats. There was a time when my favourite past time used to be playing on the waves but I indulge in it now only after I have walked to my heart’s content. The next day I spent at Bhubaneswar, did a bit of shopping for my little princess back home. My friends are going to be at Odisha for some more time. 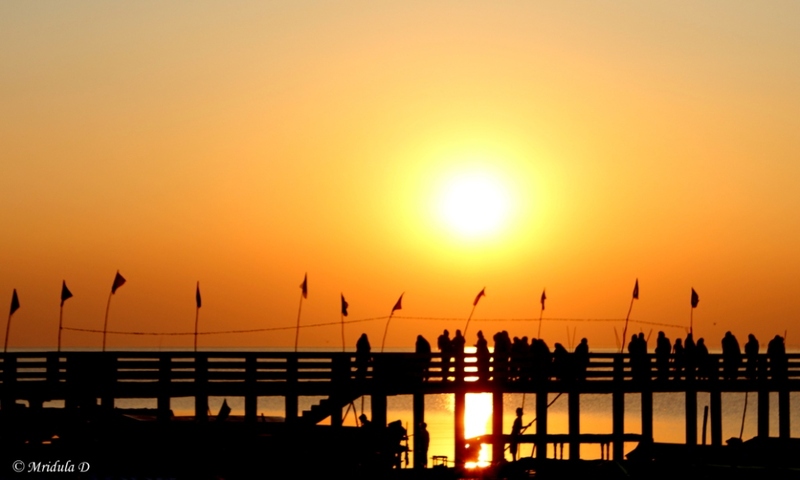 I will surely plan another trip to visit places like Chandipur and Bhiterkanika. 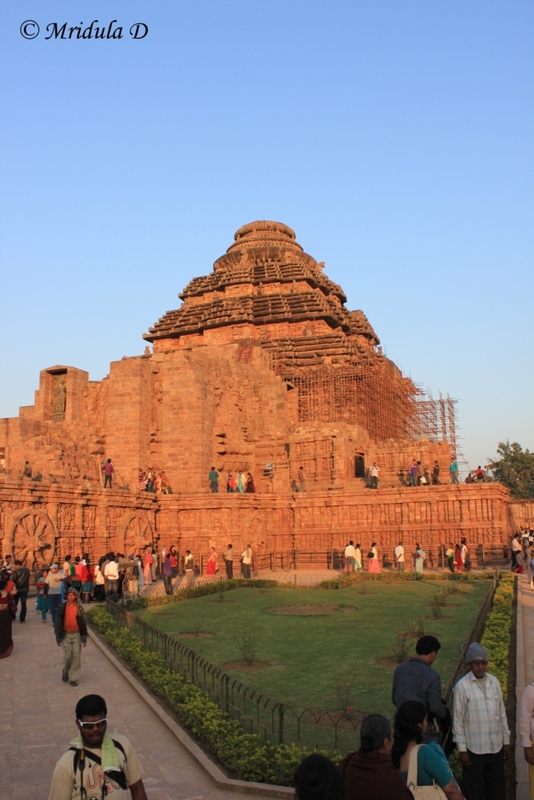 I have to admit I somehow forgot to post pictures from my visit to the Sun Temple at Konark, which is a UNESCO World Heritage Site.It is only because I am rummaging through my folders that I discovered this error. I think I didn’t blog about it immediately because the temple was under renovation when I visited it. And hence there were not too many shots that I liked. Due to the renovation this is how the place looked like. But even then it is grand, isn’t it? Also due to the renovation the murals on the wall of the Sun Temple were obscured. Since I often Google images before I visit a place, I was aware that the murals are of a sensual nature. But here is a bit of wall murals that were visible. 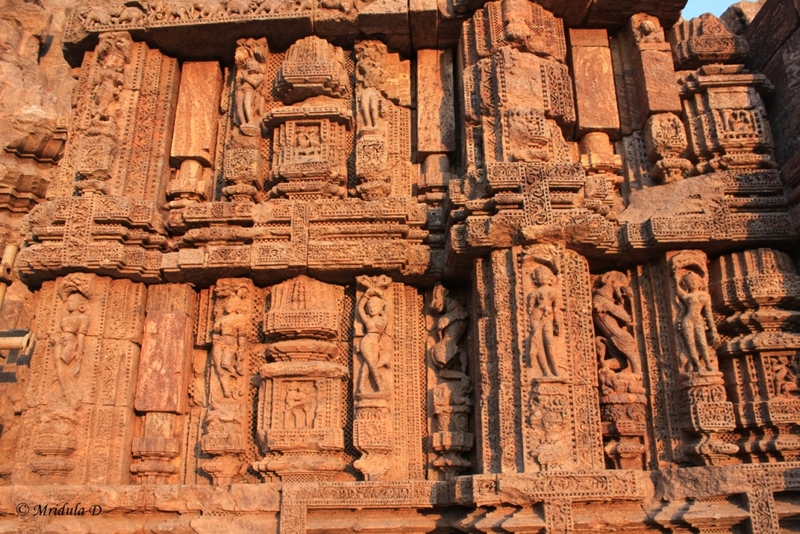 This 13th century monument is build like the chariot of the Sun God so there are many wheels built in the structure. 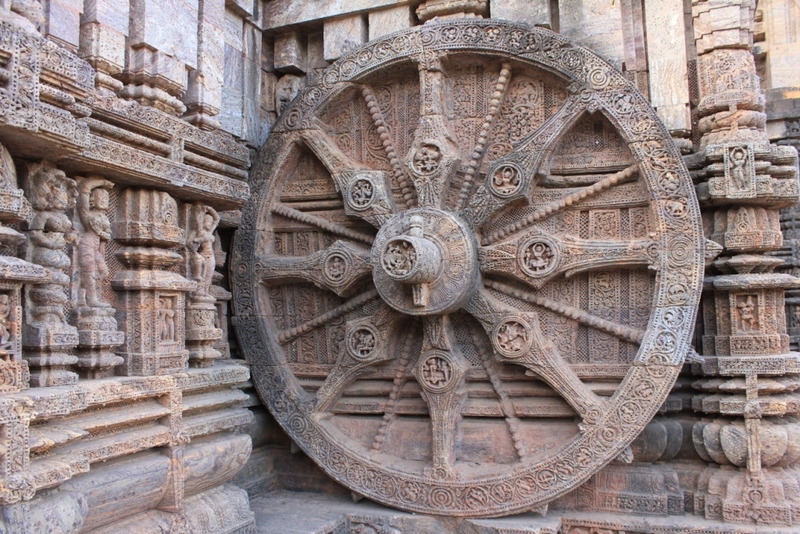 I will show you two pictures of this wheel. And I find it fascinating because of the way the light is falling on these two wheels and how it affects the pictures. In the picture above there was no direct sunlight falling on it. 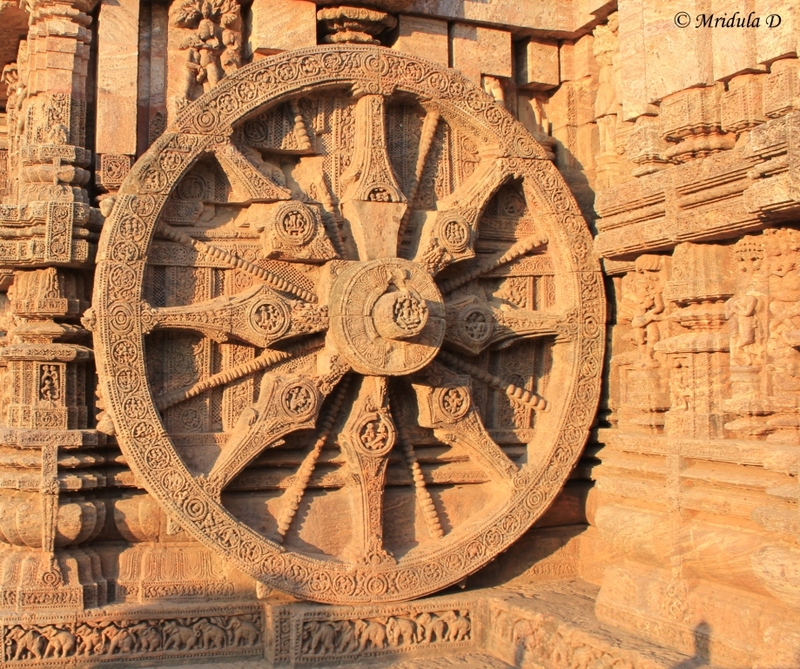 And here is the wheel that caught the light from the setting sun. Which one do you like more? Which is your overall favorite picture? What do you do when you end up at sites that are undergoing renovation? I particularly got attracted to this picture because of the reflections. But I have to let you in to a secret. In reality there were a lot of wires behind the temple, I just managed to keep them out of this shot. Doing bird photography with the wide angle lens! But sometimes it for sure makes for different pictures. Even though I liked this frame, wish I could get an elevation and click the boats nearby as well. The boat you can see in the right hand upper corner is the most expensive one that can be rented on the Chilika Lake but looking at its condition I don’t think it is much in demand. And finally this pretty young girl, spotted at Konark, even though she was not posing for me!